When I’m planning dinner I usually decide whether I want some kind of pasta dish or a meat dish. If I pick meat I then narrow it down to chicken, beef, or seafood. Somehow I never even think of pork, which is a shame. During February vacation I was staying with my Grandma down in Florida and she made Pork Chops one night. I have to admit I was a little less than thrilled, but they were very good. I decided it was ridiculous I had been cooking and blogging for almost 5 years (check out my old Summer’s Fusion – times sure have changed!) and I had never cooked Pork Chops. Don’t get me wrong. I’ve done Pork Loin several times (it’s especially good when you are camping) and I make a mean pulled pork, but the chops had evaded me up til this point. I bought some Chops Friday night and was especially happy about how inexpensive they are. No wonder so many moms have freezers full of frozen Pork Chops. When I was trying to think of what to do with the pork I remembered I had added apple sauce once when doing a slow roast and was also inspired by my mother-in-law Nancy’s ham and pineapple dish at the holidays, so I decided to give it a shot with some fruit. This serves 2 if one of you is a big tough guy with crazy metabolism. Otherwise 3. First heat up a large pan with some olive oil. Next season your Pork Chops on both sides using salt, pepper and rosemary. 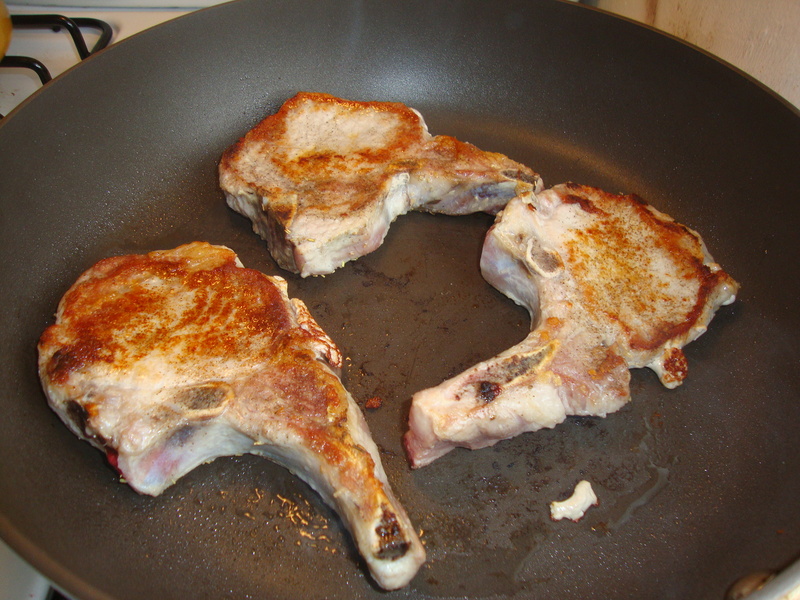 Cook your Pork Chops on both sides until a nice golden color (I think I did about 8 minutes on each side). In the meantime, chop up your apple and onion. Place in a bowl and sprinkle in cinnamon. Mix together. This is a perfect time to use up any apples you had been avoiding, such as anything with a bad spot. Some recipes I have seen call for Granny Smith apples but I use Gala because that is the kind we have with our lunch everyday, and I don’t see the need to buy anything different. Remove the Pork Chops from the heat. Put a little dab of butter in the same pan. 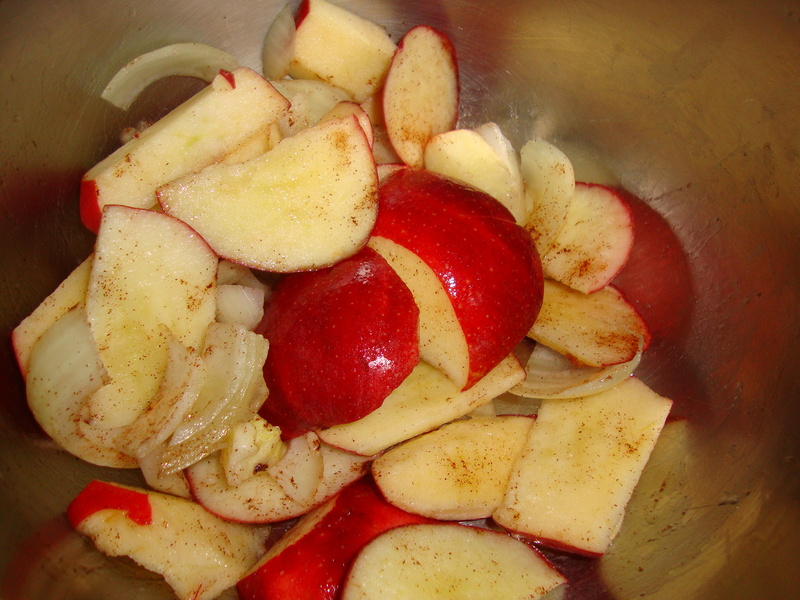 Add in the apple/onion/cinnamon mix. Stir occasionally and cook for about 10 minutes. I cut open one of my Pork Chops in the meantime because I hadn’t cooked them before and I was afraid of both under- and over-cooking them. They looked pretty good to me but I thought they could still use some more time to be on the safe side. 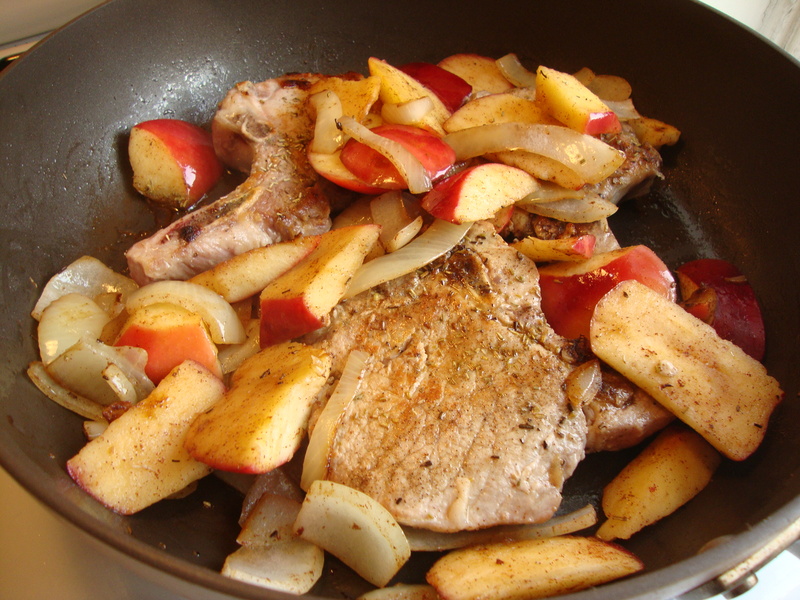 After the apples and onions get some nice golden color and start to caramelize add the Pork Chops back in. I had to make room by scooping the apple mix on top of the Pork Chops. Cook for at least 5 more minutes. Remove when Pork Chop is completely cooked (depends on your stove!). Plate with the apple mix on top of the Pork Chop. I served this with some steamed broccoli and sour dough toast.